I will be debuting my new work from my Twentynine Palms, CA trip. 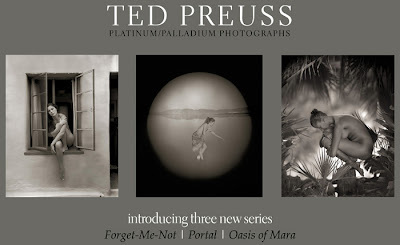 My exhibition will include a mixture of mediums from my hand-coated platinum-palladium prints and platinum leaves to large silver-gelatin prints. The Artist Project is a 4-day exhibition of contemporary art featuring a juried selection of artists with work in 2D, Mixed Media, Photography and Sculpture. It is a rare opportunity to discover and obtain art directly from a uniquely talented group of artists from around the country. The December show will run concurrently with the One of a Kind Show and Sale® Chicago taking place on the 8th Floor of The Merchandise Mart. best of luck with the show Ted! i know your work will surely impress the crowds! Thanks for your comment ! And the link... I link your blog right now !